Who Knew Motivation Could Pay You Back Not Only With Weight Loss, but Also Fitness Gear? DE, WILMINGTON, US, April 10, 2018 /EINPresswire.com/ -- MevoFit is a proven integrated approach to living fit in every environment and region. With customization that are sure to fit any users needs, goals, and lifestyle, this app is sure to stun the market yet again. This fitness application is the one-stop solution for users that provides a diet weight loss program, calories tracker with more than five-hundred-thousand food items, multiple fitness challenges for any skill level, workout programs, weight loss plans, weight tracker, healthy recipes, hydration tracker, body mass index calculator, and so much more. Consumers looking for an all-in-one fitness and diet app should give this user-friendly app a chance to prove that fitness and healthy living does not have to be life’s greatest challenge. MevoFit is an all-inclusive app designed for all fitness needs and it is loaded with fitness challenges that are guaranteed to produce results. Alternatively, users can create their own challenges making it easy to target their own person “problem areas”. Simply press the “+” button on the home page of the app and press fitness challenges to view a series of challenges that users will fall in love with including customization! Through participation and tracking with the app, users gain MevoFit Points which are credits to be used within the application. These points may be used to buy items from our select line of fitness products that are available for viewing and purchase with credit points on the app. 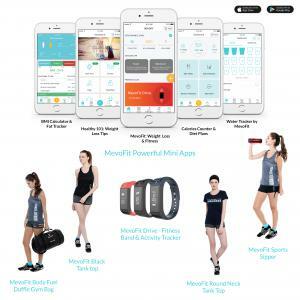 Some of the items which are available include; MevoFit Drive- fitness band, sports water bottles, waterproof gym bags, and fashionable fitness apparel with ever revolving options. The bonus to these items is not only do consumers earn them through living a healthier lifestyle, but they will also help maintain the new habits that MevoFit teaches and consumers have learned. With this app, users will reduce weight and body fat while gaining credits and amazing “swag”. This app has been voted the best free health and fitness training app for body exercise to quickly lose weight at home and gyms by following the simple instructions provided by the challenges and application features. It is easy to stay motivated with the tracking capability MevoFit offers for runs, workouts, meal planning, hydration, body fat percentage, and more. Our target is to build an absolute fitness solution, where users who are looking for health and fitness get everything at one platform at the tip of their fingers. This ease of use and access will ensure greater success with weight loss goals and continued use. Our credit program was built-in as a consumer motivator to not only help keep people on track with fitness goals and plans, but also give an additional sense of accomplishment on top of the physical accomplishments. A body transformation challenge requires selecting a set time-period to fully commit yourself and your actions to obtaining desired results. All of these features secure the consumer’s success and yet another reason why our users rave about the results they have been able to achieve. When users set specific, attainable goals, it increases their motivation and likeliness to complete the tasks required to achieve said goal. Our Credit Matrix also adds to the potential for real, physical results as consumers continue to gain credits and trade in for actual products. Credits are earned from completing fitness and diet tasks and those credits can be traded for fitness merchandise all tracked and available on the app. MevoFit Drive has now been implemented which will even better help consumers track steps, calories burned, and distance for movements made. Additionally, it shows social notifications, reminders, sedentary alerts, health suggestions, and so much more. Three more fitness tracker designs have been introduced due to the massive success of the MevoFit Drive, including; MevoFit Slim, MevoFit Bold, and MevoFit Ultra. Not only do these watches come in a variety of styles for custom fitting to each consumer’s desire, but they also feature power mini health & fitness apps within them available for download making it even easier for consumer access. These apps allow each user to download their desired apps that will track the specific things and actions that will help them achieve their goals even when their phone is not able to be on them. These apps are so integrated that any information or data recorded from the device will automatically update the application on their mobile device. Tablets also are able to download these apps for even bigger, easier to read, versions of their data collected. Run app helps the users to lose weight as it allows them to run without multiple devices on them which often slows down their productivity or creates discomfort while exercising. All MevoFit mini apps are integrated with each other as well as with the mobile apps with a singular common log in for ease of access. There is no need for remembering multiple passwords or additional user names. The MevoFit watches include a water tracker to ensure proper hydration and is always met while consumers meet weight loss goals and live a healthy lifestyle. Healthy tips notifications provided by the app produce small, easy to understand health tips throughout the day to produce the greatest results for users. The Body Mass Index calculator helps by providing healthy recipes that calculate calories, carbs, sugars, hydration, and so much more. MevoFit has many interfaces and capabilities that make it easy to use, simple to understand, and accurate for tracking purposes and data collection. This app is sure to not only keep customers on track with their personal goals, but also will allow them to build up points through accomplishments to trade for fitness gear. This app and system are built to meet all the needs, goals and wants of any consumer wanting to use these interfaces with the flexibility and customization provided. MevoFit Launches "Echo Dash" HR Fitness Band & Smart Watch - Fitness Tracker Bands with Heart Rate for Men & Women!